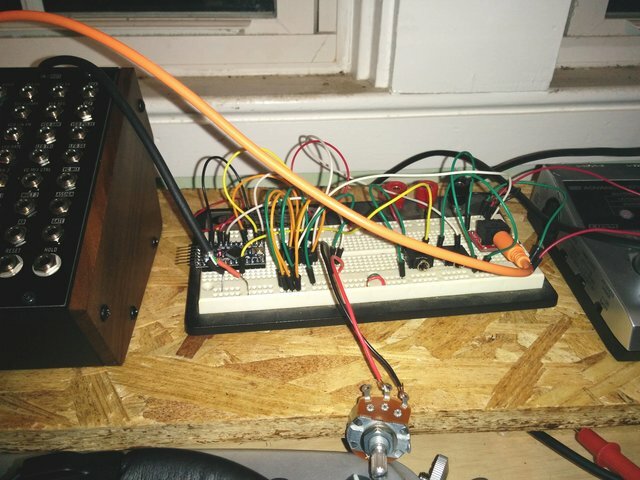 I built a prototype ribbon controller today… well, no, actually I built a prototype ribbon controller interface. For now I’m letting an ordinary pot stand in for the SoftPot. There were some stumbling blocks but in the end it’s, well, kind of working. Only one output jack is really usable, the other two are so shallowly in the protoboard they come out if you look at them funny, which may have something to do with why I haven’t gotten the gate to trigger the Mother-32. But the control voltage output does have the desired effect… other than having too small a range. That may just be a calibration thing, though, and if so there’s not much point in addressing it until the actual SoftPot is connected up. I belatedly realized a problem with using the 3.3V USB-to-serial boards; while I can power the circuit with 5V via a hacked USB cable, or I can read out the debug prints via the USB-to-serial interface, I can’t do both, which means said calibration thing can’t really be addressed with the present hardware. Except I think the 3.3V USB-to-serial I’m using is designed to be fairly easily converted to 5V. Actually all the conversion does, and all it needs to do, is to put 5V instead of 3.3V on one of the output pins. Apparently one just has to cut a trace and make a solder bridge between two pads.